Mosquito net and bed curtain borders of various Tai groups - including Black Thai (Tai Dam), Red Thai (Tai Daeng) or White Thai (Tai Khao) - may be found by collectors. This illustrated discussion aims show their construction, how they used and to put them in the context of the domestic and ceremonial life of the Tai peoples of Laos, Thailand and Vietnam. 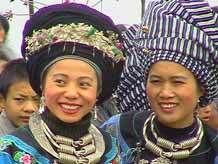 (See also Black Thai minority Vietnam and Southern White Thai Weaving Village photogalleries). A gallery of photos of Lake Inle and the Intha on the water between 6-9 September 1998. The Inthas are famous for their very individual rowing technique and floating gardens unique to the area. A gallery of photos of Intha weavers taken on 6, 7 and 8 September 1998 at Innbawkon and Ywama on Lake Inle, Shan State. It shows the processes in the preparation and weaving of weft ikat-patterned silk lon-gyi, which are called Zin me, the Burmese word for Chiangmai; weaving Shan bags and also cloth for Bhuddish monks' clothing. Click here to go to description of Intha weaving. A photogallery compiled from photos sent to me at different times since December 2002 by Wu yingjian, a Songtao Miao. The photos show Songtao Miao from Songtao Miao Autonomous County, a remote area in eastern Guizhou near the border with Hunan and Chongqing, at various festivals together with photos of local stone houses and beautiful karst limestone scenery and rice terraces. See also Songtao Miao - Embroidery.